The Polynesian voyagers who first settled in Hawaiʻi made their home on tiny islands more than 5,000 miles away from the nearest land mass. They were able to create a thriving, vibrant culture and community by living off of what was provided within nature. They had to practice sustainability in order to survive. Their sustainability practices extended into the creation of pieces of adornment ~ lei. Hawaiians constructed their lei using flowers, leaves, shells, seeds, nuts, feathers, and even animal bones and teeth. These carefully hand crafted works of art are treasured by both the maker and the recipient. Today lei is an important part our “modern culture.” Lei is given to someone to celebrate a special occasion such as a birthday, retirement, wedding or graduation. This is why lei has become a symbol of aloha. Lei making is so popular that one day a year is set aside to celebrate this art form. Lei Day is celebrated every May 1st as a way to honor the aloha that comes from making and giving lei. 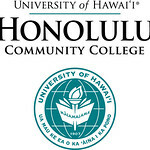 Through Hoʻālā Hou, a Title III funded program, Honolulu Community Collegeʻs Hulili Ke Kukui (Hawaiian Center) is able to offer a series of cultural workshops entitled Maliʻukaʻai that is aimed at infusing Hawaiian culture, traditions and values in teaching, learning and service. Each semester Maliʻukaʻai has workshops that focus on using readily available resources to create something useful, practical and beautiful. In the fall they hosted a workshop on coconut frond weaving and earlier this semester there were workshops on making hale cordage lashing and coconut oil. The focus of Februaryʻs Maliʻukaʻai workshop was on kamani lei making because nuts from the kamani tree are plentiful in and around the HonCC campus. Kamani trees were planted along Dillingham Boulevard in the 1920s and 30s. Today the trees are approximately 30 feet tall and have asymmetrical canopies resulting from been pruned to avoid overhead utility lines. There are many practical uses for kamani. Its timber is strong, making it perfect for carving into canoes or used in home construction. Since the wood does not have a bad taste or odor, kamani is perfect to carve ʻumeke, wooden food containers, bowls and trays. Like kukui, kamani nut oil was used to light lamps, promotes healing skin wounds and diseases, and can be used in massage. A dye can be extracted from the nut to color kapa shade of brown, and the flowers were used to give the kapa fragrance. In addition to making a kamani nut lei, Silva provided participants with an overview of the history of the kamani trees that surround HonCC and the many practical uses for the various parts of the tree.